I actually played with a prototype of the Inspiron Duo earlier this year and the conversion mechanism felt pretty solid. Dell expects it to be shipping by the end of this year. 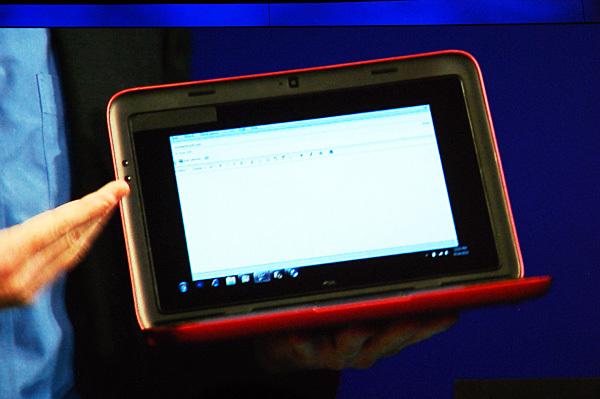 Check out our full gallery of the Inspiron Duo here. If an Atom is faster (or close) in performance to an ARM9, then why does the performance of this tablet seem sluggish compared to an iPad? - Windows 7 is larger and in general doing more things than iOS? - The Dell GPU is weaker than the iPad GPU? It is definitely slower because of Windows 7. Win7 might be too multi-purpose. iOS is very stripped down compared to OSX, which it shares a significant codebase with. 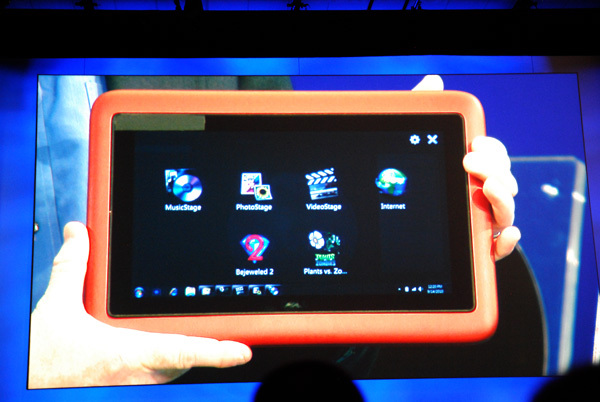 Microsoft would need a real retuning of Windows to fit it into the tablet market. Their new phone OS is for devices smaller and Windows is for everything bigger. The GPU issue is not much of an issue. The GPU on the A4 and Intel's GPUs aren't too different in performance. Features, yes. Performance, no. And the moving parts could be a hinderance to battery life, but it will have vastly more storage space than an iPad. I've never really been able to get into the tablet craze. There have been so many people trying to get it right, and occasional joyous testimonials from users claiming "these guys got it" but I've yet to see anything that really impressed me. No matter what, I just don't see how Win 7 will work on a tablet. It didn't work before on larger convertible models, and they had 10 years to try. With these low power chips, it seems even worse. So, what's changed? It seems as though MS just wants to move Windows to everything no matter what. I don't see how this is going to compete with the iPad, or the Android or Chrome models coming up later. You really can't use most software. It has to mostly be specialized stuff written for this. So where's the real software advantage? There doesn't seem to be any. I bought a Asus TM101 for my wife, which is very similar to this Dell. It was sold with the maximum memory an Atom can handle. That was because it was said to be near useless without the RAM. Regardless, it was still a slug. It was so slow it rendered the touch interface near useless. In the end I thought I would give Ubuntu Netbook remix a try. Linux worked well enough on the 701 which hardware wise was a dog, so I thought there was some hope. But not much, as I though wife would complain about the new interface. Talk about a turn around. After the obligatory hassles with finding what drivers to use on the forums, the thing was crisp. All the hardware worked. Touch gestures line pinch to zoom and two finger scrolling worked. Turned out she preferred the simplified network remix interface over the native Windows 7 one. In retrospect that is not so surprising, as the Windows interface is designed to work best with the higher resolution screens that are common on PC's nowadays. Unlike the various Linux desktop's, Microsoft seems unwilling to redesign their interface for different size displays. I recall having being initially delighted at the idea of having a "Start" button on my phone, but that came to an abrupt end about one week after owning a WinCE phone. If Microsoft doesn't get it for something as obvious as a phone, it is unlikely they will ever get it for a network. Anyway when I put Ubuntu on I insisted she try it for at least a week. At the end of the week I asked my wide if she wanted to go back to how it was before. She looked at me like I was mad.